Title: L'AMI DES PETITS ENFANS ou les Contes les plus Simples. Tomes Premier + Tome second, IVe Edit. Description: Paris, Blanchard a la Libraire D'education 4th edition. 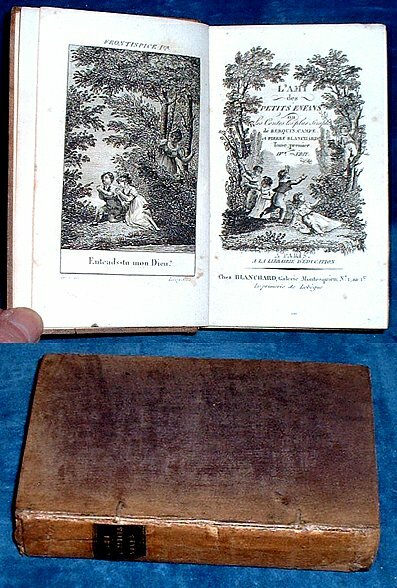 1820's but before 1827 Frontispieces (2) + engraved illustrated titlepages (2 each different) + plates (4). . Two Volumes in One cloth with black spine label gilt titled (binding worn especially to edges/corners but holding entirely firm) viii +-214pp +214pp. Coat of arms bookplate George Jacob Bosanquet of Broxbournbury [1791-1866] with name of his wife, formerly Mrs. Gaussen [widow of S. R. Gaussen of Brookmans Park] on blank side of second volume frontis. Last leaf has 1cm ink spot which shows through to previous page and to opposite page of index. It makes the word "fille" hard to read else all is legible.